Jim Warford has shared with us a copy of a piece from 2002 that was originally published in the Journal of Military Ordnance. The article is titled “T-72B MBT – The First Look at Soviet Special Armor” and it contains some of the first published photos of the armor layout of the T-72B “Super Dolly Parton.” According to the author, this article made quite a splash, becoming a much read item in defense circles. The author based the article on a unclassified version of the source report which was dated January 1999. 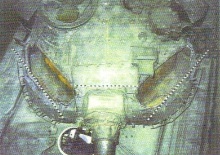 The report documented an inspection of the configuration of the ERA package as well as the armor package inside the turret frontal armor lobes of the T-72B. No information is given in the source report about where the two T-72B tanks that were examined came from, nor was any information given as to armor performance or capabilities of the armor packages examined. One of the more interesting conclusions of the evaluation is that the construction of the cavities inside the T-72B turret provides the ability to change the makeup of the special armor package either during production or during a depot-level rebuild of the tank. For people interested in late cold war Soviet armor, this article should prove very interesting!